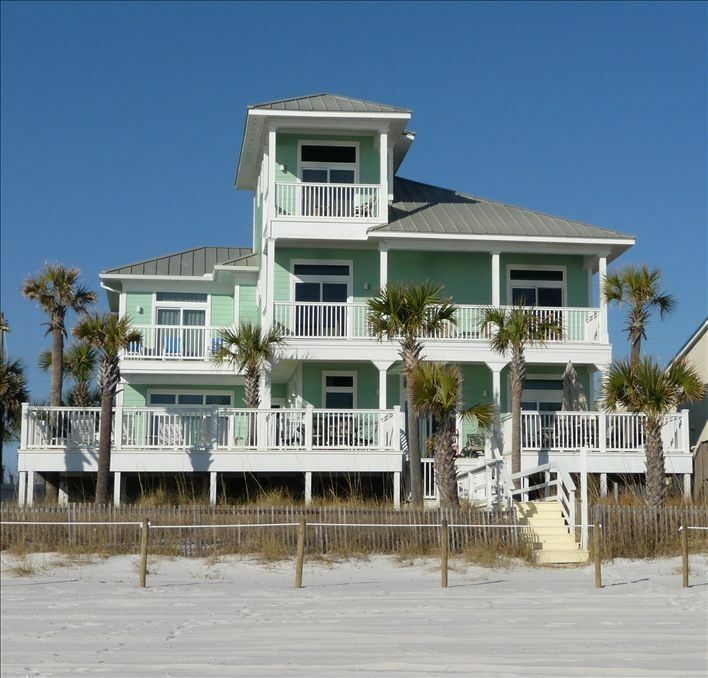 This beautiful beachfront home is located on the quiet West End of Panama City Beach. The home is exquisitely furnished and comes complete with everything needed for your vacation on the 'award winning' white sands and emerald-green waters of Panama City Beach, Florida. This home can accommodate up to 16 people in its five spacious bedrooms, den/6th BR and four and one-half bathrooms. We offer one king-size, four queen-size, two double-size, and one queen-size sofa sleeper. We provide seven televisions and DVD players for your enjoyment. The gourmet kitchen is fully equipped for those who prefer to dine in and relax. Also provided are a washer and dryer and all linens for your convenience. Gas grill and outdoor dining for 16. AMPLE PARKING FOR 6-8 CARS. Come and enjoy the view of the beaches from the three levels of private balconies that also overlook your very own private, gulf-front, swimming pool. We have a complete set-up for those traveling with infants and small children. Our combined family has been coming to Panama City Beach for more than fifty years, we have owned many properties here through out the years and have made many fond memories here. We think it's the greatest place on earth ! We had an opportunity to purchase this property and hired an Architect to custom design our home with the intent of using and sharing our home with guests. We designed all the rooms to be spacious with tall ceilings incorporating amenities with families in mind. I am a licensed General Contractor and personally oversaw the construction of this home from the ground up with emphasis on quality. Our home has 12 ft ceilings, large spacious rooms and bedrooms, clean and beautifully furnished, all rooms but one are ocean front with unobstructed views with decks or lanai's. We also have a private heated pool, ample parking and are situated on a large lot. We are conveniently located to Pier Park, grocery stores, restaurants, churches and attractions. You will not be disappointed , this is the real deal !! You won;t find a closet with bunk beds in it here as many of our competitors have, just large comfortable rooms and beds. We are right on the beach, enjoy the world famous sugar white sand beach right out your back door. Walk right out to the beach on your own private boardwalk, or enjoy the beautiful waterfront and sunsets from our large deck while relaxing in your own private heated pool. This home is absolutely beautiful! It is equipped with anything you could possibly need. The safety features around the pool were amazing. It is gated in with locks and an alarm on the door that leads to the pool. The beach access is perfect! The views were amazing! Our trip was cut short because of Hurricane Michael but the owners were very understanding and helped us out. I HIGHLY recommend this property! Thank you so much for staying with us, it is very important for our guests to have a pleasant experience at ( High Tide ) and we strive to exceed your expectations. We are looking forward to your return next year, have a safe and happy holiday season. The home was as advertised. We had plenty of room. The kitchen and family eating area were the reason we decided to cook in every meal. No need to go anywhere. We felt like the beach was our personal resort just steps from the back porch. Most relaxing vacation ever. Thank you for the review, we are pleased that you and your family found " High Tide " and that it met or exceeded your expectations. We take pride in our home and strive to keep it in pristine condition for our guests, our goal is to give you great value for your money and to have you return year after year. Thank you so much for staying with us and we hope to see you in the near future. Great location, great house. I would change out the pull out couch in the loft. We had a great vacation to Panama City beach with 4 adults and 9 kids! We were close to everything, yet on a part of the beach that wasn’t over run with spring breakers. Hi Sarah, we are happy that you had a great time in PCB and our home. We agree our location offers a quiet beach setting and yet we are close to all attractions, dining and shopping. We are sorry you did not find the sleeper sofa to your satisfaction, they can be somewhat uncomfortable by their design and for that reason we keep a mattress topper next to the sofa for your use. We have not had previous feedback regarding the sofa but we will certainly take into consideration. Thank you so much for choosing to stay with us and we hope to see you in the future. This was a wonderful home for our family vacation. With 10 adults and 4 children ages 7 months to 5 years, there was plenty of room for everyone. The open downstairs floor plan allowed for lots of family time even during meal preparation. The large outdoor deck area gave us plenty of room to spread out and the two dining tables made dining outdoors a pleasure. Having the beach right out the back door was so convenient, especially with the little ones. The pool was perfect for the children (and adults) to take a break from the beach and cool off. Also no unruly children running over the top of our children. The owners were great. We had many questions and they were always very responsive. During our stay the microwave died - no problem! We had a new microwave installed very quickly. For a vacation with a large family, this is definitely a great place. This house was perfect for our family vacation with 8 adults and 7 young children. Grandma and Grandpa enjoyed the secluded first floor master suite and everybody else spread out over the enormous upstairs. It was so nice to have a bathroom for every family. Beds were super comfy. We appreciated the baby gear provided. Being located right on the beach was wonderfully convenient and made it easy to enjoy the gorgeous views hanging out by the pool, sitting on the decks and from most of the windows This home is beautifully designed and we very much hope to return and enjoy it again! We had 10 in our party. We had an awesome time! The weather was terrible, but the atmosphere of the house and pool made up for it. I will definitely stay there again!